The Pentax K-r is already available in black, white and red. Pentax will make its entry-level K-r DSLR available in five new colours, the company has announced. 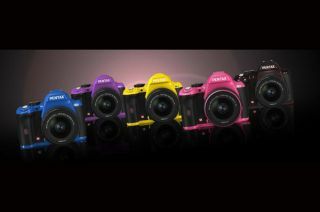 From July, the Pentax K-r will be available in yellow, pink, blue, purple and metal chocolate. The 12.4-megapixel Pentax DSLR, released last year, is already available in black, white and red models. Among the Pentax K-r's top features are a sensitivity range from ISO 100 to 25,600, 6fps high-speed continuous shooting and a SAFOX IX AF sensor with 11 selectable points. The Pentax K-r price tag sits at £529.99, and the each coloured K-r body is available to purchase in a standard kit that includes the DA-L 18-55mm lens.